Al-Sultan Al-Mu’tassimu Billahi Muhibbuddin Tuanku Al-Haj Abdul Halim Mu'adzam Shah ibni Almarhum Sultan Badlishah (Jawi:zالمرحوم سلطان عبدالحاليم معظم شاه ابن المرحوم سلطان بدليشاه; z28 November 1927 – 11 September 2017) was the 28th Sultan of Kedah, reigning from 1958 to 2017. He served as the fifth Yang di-Pertuan Agong of Malaysia from 1970 to 1975, and as the 14th Yang di-Pertuan Agong from 2011 to 2016. He was the first person to reign as Yang di-Pertuan Agong twice, as well as the oldest elected to the office. Immediately prior to his death, he was the second longest-reigning living monarch in the world after Queen Elizabeth II of the United Kingdom. Born at Istana Anak Bukit near Alor Setar as Tunku Abdul Halim ibni Tunku Badlishah, he was the second, but eldest surviving son, of Sultan Badlishah (1894–1958; reigned 1943–1958), who later became the 28th Sultan of Kedah. Of Malay and Thai descent, his mother was the Kedah-born princess Tunku Sofiah binti Tunku Mahmud (born 1899), who died in an automobile accident on 28 February 1934. Abdul Halim's maternal grandfather, Tunku Mahmud, was once Raja Muda (heir presumptive) to the throne of Kedah. He was educated at Alor Merah and Titi Gajah Malay schools and Sultan Abdul Hamid College in Alor Star between 1946 and 1948. He went on to Wadham College, Oxford and obtained a Diploma in Social Science and Public Administration. He subsequently joined the Kedah Administrative Service, serving in the Alor Star district office and later, the state treasury. On 6 August 1949, Tuanku Abdul Halim was appointed Raja Muda or heir apparent, and acceded as the twenty-eighth Sultan of Kedah on his father's death on 14 July 1958. He was installed at the Balai Besar, Kota Star Palace in Alor Star on 20 February 1959, in a ceremony not held since 1710. Tuanku Abdul Halim celebrated his silver jubilee on 15 August 1983 with his royal consort, Sultanah Bahiyah. To commemorate this occasion the Kedah government opened The Jubli Perak Park at Sungai Petani, Kedah's 2nd Largest town. On 15 July 2008, Tuanku Abdul Halim Muadzam Shah celebrated his Golden Jubilee as the Sultan of Kedah. He is only the fourth Sultan in a line of 28 Sultans who have celebrated 50 years of reign in Kedah. In conjunction with the Golden Jubilee, 15 July 2008 was declared as a public holiday for the whole state of Kedah. A ceremony of handing over the contributions in conjunction with the Golden Jubilee was held at the Istana Anak Bukit on 6 July 2008 by Kedah Chief Minister Azizan Abdul Razak. Throughout the whole week of the Golden Jubilee, various events were held to commemorate the Sultan. Tuanku Abdul Halim (as he became) served as Deputy Yang di-Pertuan Agong from 21 September 1965 to 20 September 1970. 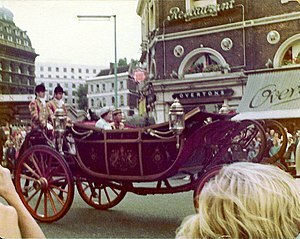 Abdul Halim in a carriage with Elizabeth II on a state visit to London, 1974. Tuanku Abdul Halim was elected as the fifth Yang di-Pertuan Agong of Malaysia and served his term in office from 21 September 1970 to 20 September 1975. He was the third youngest monarch to ascend the throne of Yang di-Pertuan Agong after Tuanku Syed Putra of Perlis and Tuanku Mizan Zainal Abidin of Terengganu. During his kingship, Tuanku Abdul Halim presided over the first transfer of power of the civilian government when his uncle, Prime Minister Tunku Abdul Rahman resigned in favour of his deputy Tun Abdul Razak. Tunku Abdul Rahman had felt that he should not serve under a nephew, given strict Malay royal protocol, but agreed to stay on as prime minister for one day of Tuanku Abdul Halim's reign. On 2 November 2006, Tuanku Abdul Halim was for the second time elected Deputy Yang di-Pertuan Agong to serve a five-year term. He is the first person to have been elected twice to this office. In October 2011, Abdul Halim was elected to serve a second term as the Yang di-Pertuan Agong, which commenced on 13 December 2011. He is the first regnant sultan to hold the position twice. He is also the oldest Malay Ruler to be installed as Yang di-Pertuan Agong at 84 years and 15 days old, surpassing the previous record holder, Sultan Salahuddin Abdul Aziz of Selangor, who was installed at 73 years and 49 days old. He was officially installed on 11 April 2012 at Istana Negara. 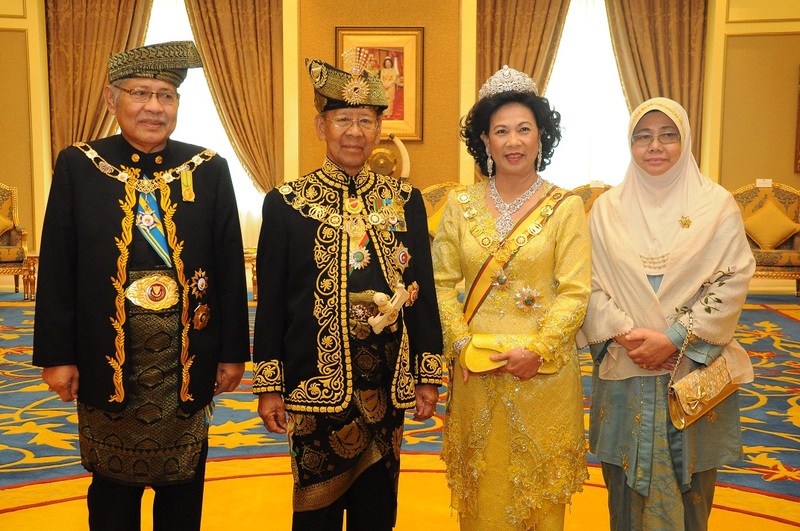 During his tenure as Yang Di Pertuan Agong, a Council of Regency consisting of his brothers Tunku Annuar (d. May 2014), Tunku Sallehuddin, Tunku Abdul Hamid Thani, and daughter Tunku Puteri Intan Safinaz was assigned to discharge Abdul Halim's duties as Sultan of Kedah. His tenure as Yang Di Pertuan Agong ended on 12 December 2016. 2. Sultanah Haminah, married 1975. A commoner from Perak, she was titled Che Puan Kedah until 9 January 2004 when she was crowned as Sultanah. She served as Raja Permaisuri Agong during his second term as Yang di-Pertuan Agong. Sultan Abdul Halim died on the 11th September 2017, at the age of 89, at Istana Anak Bukit in Alor Setar. He was laid to rest at the Langgar Royal Mausoleum in Alor Setar on the day after his death. His style and title in full on 13 December 2016 became: Kebawah Duli Yang Maha Mulia Al-Sultan Al-Mu'tassimu Billahi Muhibbudin Tuanku Alhaj Abdul Halim Mu'adzam Shah ibni Almarhum Sultan Badlishah, Sultan Negeri Kedah Darul Aman dan Jajahan Takluknya (His Royal Highness Al-Sultan Almu'tasimu Billahi Muhibbudin Tuanku Al-Haj Abdul Halim Mu'adzam Shah ibni Almarhum Sultan Badlishah, the Sultan of Kedah, Abode of Peace and it's Dependencies). Tuanku Abdul Halim held the rank of Marshal of the Royal Malaysian Air Force in his previous constitutional duties as Commander-in-Chief of the Malaysian Armed Forces as well as the ranks of Field Marshal of the Malaysian Army and Admiral of the Fleet of the Royal Malaysian Navy. Since 1972 he was the Royal Malay Regiment's Colonel-in-Chief, and also performed the same functions for the Malaysian Army's Royal Service Corps. Sultan Abdul Halim Muadzam Shah Bridge, also known as the Penang Second Bridge, was named after him on 1 March 2014. Politeknik Sultan Abdul Halim Mu'adzam Shah (POLIMAS) in Jitra, was also given in honour of his name. ^ "Sultan of Kedah to be next Yang di-Pertuan Agong, for second time". The Malaysian Insider. 14 October 2011. Archived from the original on 15 October 2011. Retrieved 15 October 2011. ^ "Kedah Sultan Reminds Council of Regency To Carry Out Duties With Honesty". Bernama. 12 December 2011. Archived from the original on 12 December 2011. Retrieved 13 December 2011. ^ Mohd. Rafie Azimi (11 September 2017). "Sultan Kedah mangkat" [The sultan of Kedah passed away] (in Malay). Utusan Malaysia. Retrieved 11 September 2017. ^ "Kedah's Sultan Tuanku Abdul Halim passes away". The Star. 11 September 2017. Retrieved 11 September 2017. ^ "Almarhum Sultan Kedah Dimakamkan Di Makam Diraja Langgar". Addin (in Malay). 12 September 2017. Retrieved 12 September 2017. ^ "Photographs of Tuanku Abdul Halim, Yang di-Pertuan Agong of Malaysia". Janus. Retrieved 26 April 2011.